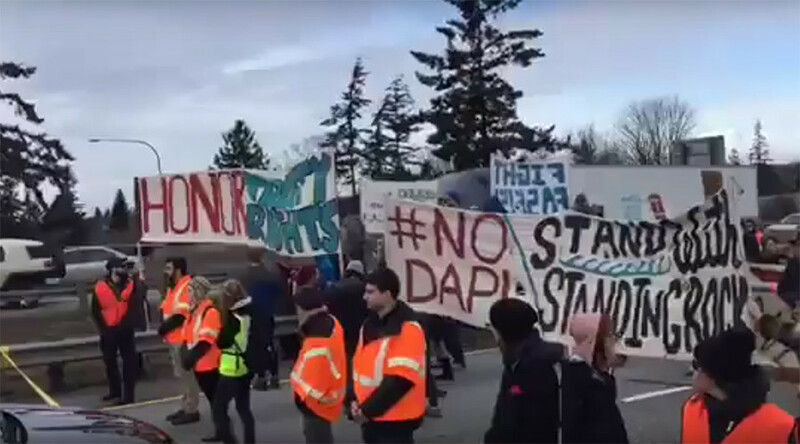 A search warrant was issued after a protest over the Dakota Access Pipeline caused a traffic jam in Bellingham, Washington. The ACLU argues the warrant violates protesters’ First and Fourth Amendment rights. The Whatcom County Sheriff's Department is seeking to search private data from the Bellingham #NoDAPL Coalition Facebook page, including messages, photos, videos and other personal information from the page, as well as data relating to anyone who interacted with the group. The warrant timeframe spans from February 4 to 15, and surrounds a protest in Bellingham that occurred on February 11, when protesters blocked access to the northbound lanes of Interstate 5 for around an hour, causing a four-mile-long traffic jam. The protest was in response to President Donald Trump signing the executive order, greenlighting construction of the DAPL and Keystone XL pipelines. Protesters were calling on city leaders to close the $80 million account with US Bank, a financial supporter of the pipeline, and for the government to respect indigenous sovereignty. Several local police departments responded to the protest, including the Washington State Patrol troopers. In total, police removed around 100 protesters from the highway, some of whom were chained together. No violence was reported, but the search warrant says that authorities are weighing the possibility of charging protesters with reckless endangerment, a misdemeanor. According to the Washington State Patrol, the protests began when five cars stopped on the highway, blocking two lanes. After the demonstration was over and traffic began to flow, police responded to a five-car pile-up about 3 miles south. In a press release following the protests, Washington State Patrol requested witnesses who observed the five vehicles that initially blocked traffic to come forward with any information they had. The search warrant was issued February 16 by a state judge. Soon after, Facebook informed Neah Monteiro, the page's top admin, they had received the warrant for data relating to the group. “Overbroad warrants like this one have far-reaching implications,” Brett Max Kaufman, a staff attorney with the ACLU’s Center for Democracy, said in a statement. “Government requests for information protected by the First Amendment must meet a high bar in order to ensure that political speech and advocacy are not chilled. The Constitution gives wide berth to that kind of civic participation, and law enforcement must respect that space in carrying out its activities,” Kaufman said. According to the motion, Monteiro has standing to quash the warrant, which violates the constitution by permitting a “generalized search” of private data that is protected by the First and Fourth Amendments. If upheld, the warrant could affect “any member of the public, supportive or not, who interacted with the group.” In effect, any individuals who interacted with the group via Facebook at some point during the 12 days covered by the warrant, including those who simply asked the group questions about their activities or engaged any members of the group in political debate, could have their private information searched, according to the motion from the ACLU. A hearing is scheduled for March 14 in Whatcom Superior Court.